A photo memory of The Masters Tournament from the first round of the 2011 Masters. 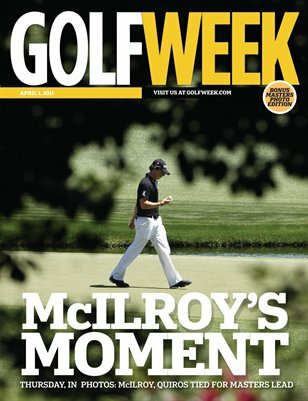 Featured in this edition are Rory McIlroy and Alvaro Quiros, as well as those who are chasing him. Tiger Woods and Phil Mickelson among that group. Don't forget Rickie Fowler, K.J Choi and Y.E Yang. Keepsake photos of Arnold Palmer and Jack Nicklaus hitting the opening tee shots are in here as well. Published in four-color beauty on heavy stock, this issue is one to keep in your Masters collection.